Welcome to "Women in Discipleship." We desire to share with you the joy of Christian fellowship in a way that enhances your daily routine. Our goal is to offer helpful life applications that will assist you where you are. As you explore this web site, we hope you’ll enjoy the Events, Updates, Resources, and Opportunities that are available. Each week you can log on or request via e-mail our Weekly Focus devotional. It will take just a moment to read but can encourage your whole day. 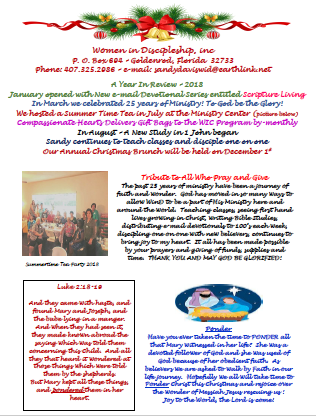 The Updates page on this web site offers our current Newsletter, which will inform you of upcoming events, bring words of encouragement, share in praises, offer prayer requests, and give you helpful ways to grow spiritually. A New Feature on our website is the Online Bible Study. It can be your resource for wonderful times of personal devotion with the Lord. Take your time and browse the site. Let us know how we can help you.